At least 7.68 million people across 10 Chinese provinces have been affected by extreme rain events and sever flooding, said the Ministry of Civil Affairs. Weather related disasters have left dozens of people dead or missing, destroying thousands of homes and hundreds of thousands of hectares of crops. “In east China’s Jiangxi Province, six people died, according to the provincial civil affairs department. Among them, two drowned in swollen rivers, while four were killed by lightening. “Three people remain missing, 105,700 hectares of crops were ruined, 969 houses destroyed and direct economic losses have been estimated in the region of 2.16 billion yuan (about 328.5 million U.S. dollars). “About 199,000 people have been displaced, including about 13,000 from Guxiandu, Poyang County where a river breached its banks on Monday evening. More than 400 armed police plan to mend a 100-meter gap in the river defenses on Wednesday. “We’re waiting because the water level remains high,” said a police spokesman. “In Hunan province, a flooded river in Longshan county forced about 18,500 residents to leave an ancient township. “In neighboring Guizhou province, rescuers saved more than 150 residents who were stranded after their villages were flooded in Yanhe county. More than 1,500 people were relocated,” local media reported. Storms seem to be competing for dumping the largest amount of precipitation on multiple regions, with record rainfalls reported across many areas. Extreme rain events have triggered large-scale landslides burying several villages in Kegalle District, about 70 kilometers (45 miles) north of the capital, Colombo. At least 200,000 people have lost their homes. Up to 60 people were confirmed dead, as of posting. Hundreds of families are missing, feared buried by landslides. More than a dozen people were killed by lightning strikes. At least 19 of the country’s 25 districts have experienced flash flooding. Severe flooding reported in several cities including Colombo. Flooding in Pakistan’s northwest and in Kashmir has claimed more lives raising the death toll to at least 71 Tuesday, officials said. “The number known to have died in rains so far in the northwest has now risen to 61 with over 350 houses damaged all over Khyber Pakhtunkhwa,” the local officials said. At least 28 people have been killed in severe flooding in two remote regions of Ethiopia, reported the official news agency. At least 23 people were killed and 84 others injured after a river that crosses Jigjiga, the regional capital of the Somali region, burst its banks on Sunday. Extreme rain events flooded the drought-stricken region of Afar, causing severe flooding, and killing five people, AP reported. 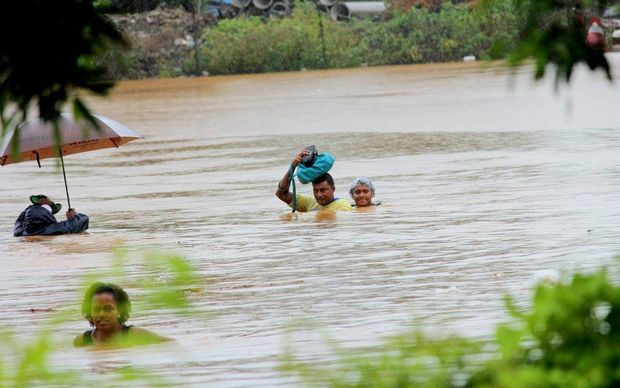 The town of Nadi has been submerged under meters of floodwater since Sunday after heavy rain, and people throughout Fiji brace for even more flooding. More than 3,500 people have fled their homes seeking shelter in about 80 evacuation centers in the north and west of the main island Viti Levu, as a double whammy of tropical depressions continue to impact the country, said a report. At least one person was killed and another missing in weather related incidents. Category 5, Severe Tropical Cyclone WINSTON struck the island nation on 20 and 21 February cutting a path of destruction across the country, wiping out entire communities/villages, and prompting the government to declare a state of disaster. Drought-stricken Palau could dry up completely this month, officials warned Monday as the Pacific island appealed for urgent international aid, including shipments of drinking water. “We’re still in the state of emergency, there’s a sense of urgency to address the crisis,” a government spokesman told AFP as the National Emergency Committee (NEC) met to discuss strategy. Extreme rain events in India’s Tamil Nadu state, said to be the heaviest the region has experienced in 50 years, have triggered severe flooding forcing the main airport in southern India to close, cutting off roads and highways, and leaving tens of thousands of people stranded. Chennai [metro pop: 9 million] is the capital city of the Indian state of Tamil Nadu. It’s located on the Coromandel Coast off the Bay of Bengal, and is the largest industrial and commercial hub of southern India. It is the country’s fifth-largest city and fourth most populous metro area, and 36th-largest urban area in the world. Floods in Tamil Nadu state have killed hundreds of people since last month, when 160 hours of non-stop rain paralyzed the city. About 20 percent of the population have been affecetd, according to local estimates. The city’s airport was forced to shut down indefinitely on Tuesday after floodwaters buried the runway, according to local reports. Floodwaters have also inundated railroad tracks, forcing many cancellations. Ranked 4th in hosting the largest number of Fortune 500 Indian companies, following Mumbai, Delhi and Kolkata, with a nominal economy of about US$60 billion, Chennai has a broad industrial base in the automobile, computer, IT, manufacturing and others sectors. The worst affected areas are the eastern state of West Bengal, neighboring Odisha, as well as the western states of Gujarat and Rajasthan, and the northeastern state of Manipur, officials have said. Cyclone KOMEN, tracking across the Bay of Bengal, has brought heavy rains to the states of West Bengal and Odisha, submerging hundreds of villages and leaving more than 150,000 people homeless, according to local reports. Meanwhile, heavy monsoon rains have left scores of people dead and affected up to a third of a million others across 12 of Myanmar’s 14 states and regions. “About 850,600 acres (344,493 hectares) of farmlands were submerged, of which Rakhine state suffered the most with over 260, 000 acres (105,300 hectares), an official of the Ministry of Agriculture and Irrigation told Xinhua. “Most of the country’s major rivers have reached or above their danger levels, said the Meteorology and Hydrology Department,” said a report. Floods and landslides triggered by extreme rain events since June have impacted large portions of the country, destroying homes, businesses, and farms as well as much of the public infrastructure. Venezuelan President Maduro has declared a state of emergency in the municipality of Paez, Apure state, after extreme rain events (ERE) triggered severe flooding, said a report. The floods in Paez have been described “as the worst to hit the area in over two decades.” More than two weeks of torrential rains have caused two major rivers to burst their banks inundating large areas, and affecting more than 40,000 people. In 2010, floods affected more than 1.5 million Venezuelans across three states and the capital, Caracas, killing dozens of people and destroying thousands of homes and businesses. Gov. Hutchinson has amended an earlier Disaster Proclamation for Arkansas adding to the disaster areas four more counties that are affected by extreme rain events and floods. Those areas are Conway, Jefferson, Perry and Sebastian counties, bringing the total disaster areas to 31 across the state. The disaster areas in the original Proclamation included Madison, Newton, Marion, Searcy, Izard, Independence, Franklin, Johnson, Pope, Scott, Yell, Polk, Montgomery, Garland, Sevier, Howard, Pike, Little River, Hempstead, Nevada, Ouachita, Chicot, Crawford, Miller, Lafayette, Logan and Faulkner counties. The U.S. Department of Agriculture (USDA) has declared crop disasters in 41 counties across five states—Alabama, Georgia, Kansas, Nebraska,Texas—due to the losses and damage caused by extreme weather and climatic events. Texas: Delta, Franklin, Hopkins, Hunt, Rains and Wood counties. Alabama: Clay, Cleburne, Chambers, Chilton, Coosa, Elmore, Lee, Macon, Randolph, Shelby,Talladega and Tallapoosa counties. Georgia: Carroll, Heard and Troup counties. Kansas: Brown, Clay, Cloud, Jackson, Jewell, Lincoln, Marshall, Mitchell, Nemah,Osborne, Ottawa, Pottawatomie, Republic, Riley and Washington counties. Nebraska, Gage, Jefferson, Pawnee, Richardson and Thayer counties. Beginning January 10, 2014 USDA has declared crop disasters in at least 2,768 counties across 41 states. Most of those designations are due to drought. iii. Some counties may have been designated crop disaster areas more than once due to multiple disasters. v. The disaster designations posted above were approved by USDA on October 22, 2014. Dozens of people are dead or missing in southern Morocco after severe flooding, triggered by Extreme Rain Events (EREs), swamped large swaths of the semi-desert country, authorities said. The floods have destroyed or severely damaged scores of homes across several regions including Agadir, Guelmim, Marrakesh, Ouarzazate and Tiznite, according to reports. Hundreds of tourists were forced to evacuated the affected areas. Extreme Rain Events (EREs) since late October have flooded the Luján River, inundating large areas across 23 districts in Buenos Aires Province, and forcing more than 5,300 evacuations, government sources were reported as saying. The worst affected areas are Tigre, Quilmes, San Fernando, Ensenada and Lomas de Zamora, as well as Luján and La Matanza. At least two deaths have been attributed to the flooding, said a report. Flood alerts have been issued for central and southern Slovenia as extreme rain events continued to pound the country. Thousands of homes around Ljubljana, the capital and largest city of Slovenia, have been flooded as rivers continued rising, local media reported. Mass evacuations were ordered in coastal areas of Tuscany and Liguria, as extreme rain events triggered severe flooding and mudslided. Authorities issued a “red alert” for most of Liguria. “Schools have been closed in Carrara, which is halfway between Florence and Genoa, while trains have also been stopped,” said a report. In the Tuscan city of Carrara, halfway between Florence and Genoa, more than 200 meters of riverbank collapsed into Carrione River, with floodwaters trapping hundreds of families inside their homes. The Po River in Lombardy rose by more than two meters in 24 hours on Wednesday. The lagoon city of Venice was also flooded by high water. Piemonte and parts of Liguria have also been put heightened alert amid EREs, said reports. Extreme Rain Events have left at least 9 cities and 45 towns in SW China in a “State of Disaster,” affecting millions of people, displacing hundreds of thousands, and killing or injuring scores of others. Many people are missing. “Continuous heavy rains have battered Sichuan since Sept. 8, leaving about 2.5 million people in nine cities in a state of disaster and forcing 160,000 among them to relocate to avoid risks, said the flood control headquarters of Sichuan,” said China’s official news agency, Xinhua. The rainstorms have destroyed at least 8,200 housing units in the province causing major rivers to flood, said the report. Raging floodwaters have destroyed or damaged thousands of hectares of crops and swept away scores of livestock. Extreme rains will continue to pound southwest and central China, according to the National Meteorological Center (NMC) forecast on Sunday. The U.S. Department of Agriculture (USDA) has designated a total of 26 counties in five states–Texas, North Carolina, Nebraska, New Mexico and Kansas–as crop disaster areas due to losses caused by drought, frost, extreme rain events and high winds. A total of 9 counties in Texas and one county in New Mexico have been designated as crop disaster areas due to ongoing drought. Texas: Crane, Winkler, Andrews, Ector, Pecos, Ward, Crockett, Loving and Upton counties. 11 Counties in Kansas and Nebraska have been declared crop disaster areas due to damages and losses caused by drought and frost that occurred during the period of January 1, 2014, and continuing. Kansas: Republic, Washington, Clay, Cloud, Jewell, Marshall and Riley counties. Nebraska: Gage, Jefferson, Nuckolls and Thayer counties. USDA has designated five counties in North Carolina as crop disaster areas due to damages and losses caused by excessive rain and winds that occurred on July 3, 2014. North Carolina: Pamlico, Beaufort, Carteret, Craven and Hyde counties. Beginning January 10, 2014 USDA has declared at least 2,315 separate crop disasters across 35 states. Most of those designations are due to the ongoing drought. v. The disaster designations posted above were approved by USDA on September 10, 2014. Kashmir’s worst flood in 50 years has left about 500 people dead, hundreds of thousands displaced and millions of others severely affected. More than 2,500 villages and several major cities on both sides of Kashmiri heavily militarized divide have been inundated. The worst-hit cities include Srinagar, the capital of the Indian State of Jammu and Kashmir, which is almost completely submerged by floodwaters, and city of Jhnag [population: ~ 400,000,] the capital city of Jhang District, in the state of Punjab, Pakistan. Floodwaters have swept away everything, officials said. Many people have lost their homes and livelihoods. The White House has declared a major disaster exists in the Territory of American Samoa in the areas affected by severe storms, flooding, and landslides during the period of July 29 to August 3, 2014. Nevada Gov. Sandoval has declared a state of emergency after extreme rain events, a combination of monsoon rains combined with remnants of Tropical Storm Norbert inundated the Southwest earlier this week. The town of Moapa received nearly 110mm of rain in just two hours, NWS reported. Dozens of homes were also flooded in nearby town of Overton. Flooding destroyed a 80-km section of a Interstate 15 north of Las vegas and inundated large swathes of Clark County and the Moapa Paiute Reservation. Arizona Gov. Brewer declared a statewide emergency as record rains swamped large swathes of SW U.S., prompting flash-flood warnings in four states— Arizona, California, Nevada and Utah. Severe flooding, described by NWS as “life-threatening situation,” forced authorities to shut down Interstates 10 and 17 in Arizona as well a large section of Interstate 15 in Nevada. At least two people were killed in Arizona and hundreds of drivers were forced to abandon their vehicles on the swamped interstates. A record 84mm of rain fell on Phoenix’s Sky Harbor International Airport, shattering previous record of 74mm set in September 1939 for the city’s most rainfall in a single day, according to reports. In Tucson, 32mm of rain at Tucson International Airport also set a new record, breaking the previous single-day record of 24mm. Severe flooding and landslides caused by extreme monsoon rains have submerged large swathes of India and Pakistan, killing more than two hundred people, leaving hundreds of thousands marooned and affecting at least 10 million others. Floodwaters washed away thousands of homes and triggered landslides in both Indian-administered Kashmir, states of Orissa and Andhra Pradesh, as well as in Pakistani-administered Kashmir and Punjab. Hundreds of thousands of hectares of crops have also been destroyed across the two countries. In August, extreme rain events flooded 1,746 villages, affecting about a million people in Pakistan, officials said. Flooding killed or injured more than a thousand people and 4, 555 heads of cattle, destroying 11,172 houses and 412,083 acres of standing crops. States of emergency have been declared across several municipalities after Extreme Rain Events triggered severe flooding, claiming several lives, affecting hundreds of thousands of people and causing extensive damage to property and infrastructure. The worst affected areas include municipalities of Galabovo and Opanand in Stara Zagora District and Primorsko Municipality, according to local reports. A ferocious wildfire burning near Yosemite National Park has forced the Mariposa County Sheriff’s Office to order the evacuation of hundreds of homes. In August, the El Portal fire consumed more than 4,700 acres west of Yosemite National Park, prompting Gov. Brown to declare a state of emergency. Evacuations: Evacuations are still in place for homes on Harris Cutoff Road, Chowchilla Mountain Road and all of the Ponderosa Basin area. At least half a million people have been affected by extreme rain events and severe flooding across four cities in east China’s Zhejiang Province since August 8, with about 65,000 people displaced, according to China’s official news agency, Xinhua. Up to a thousand houses have collapsed, and 26,100 hectares of croplands have been damaged, of which 1,400 hectares were completely destroyed, said the report. Meantime, a severe drought in NE China has left about a third of a million people without drinking water. Drought in northeast China’s Liaoning Province has left about 330,000 people and 82,000 head of livestock without water, said authorities, Xinhua reported. Liaoning has received less than 40 percent of its average rainfall between July 1 and August 17, and the dry, hot weather is forecast to continue, said the report. Record rainfall in parts of New York’s Long Island triggered severe flash floods turning roads into rivers during the morning rush hour on Wednesday. Up to 33 cm of rain was recorded at MacArthur Airport in Islip over a 24-hour period, according to the National Weather Service (NWS) breaking the previous record of 29 cm that was set in August 2011 in the Hudson Valley during Tropical Storm Irene. During a particularly intense two-hour period the area received “more than two months of rainfall in two hours,” said NWS. The record rainfall contributed to at least one fatality. Flooding shut down parts of major commuter routes and forced the closure of the Long Island Rail Road, the largest commuter railroad in the U.S.
Floodwaters reportedly destroyed a number of homes and caused sewage backup, forcing dozens of people to evacuate in southern New Jersey. The same weather system was responsible for extreme rain events in Washington and Baltimore on Tuesday, said NWS. Earlier this week, at least one person died in Detroit floods after record rainfall. A state of emergency has been declared in Mechanicville City, NY, due to severe flooding. No traffic is being allowed in or out of the city, and residents are told to stay indoors until further notice. “A boil water advisory is in effect for the city,” said a report. The authorities in central Siberia’s Krasnoyarsk region have declared a state of emergency due to forest fires, most of which are burning in hard-to-reach terrain, the region’s acting Natural Resources and Ecology Minister told reporters, said a report. Aided by hot, dry weather, more than 50 forest fires have consumed at least 2,000 hectares. The town of St-Colomban, Que., has declared a state of emergency after heavy rain flooded roads, triggered landslides and inundated sewers, said a report. The U.S. Department of Agriculture USDA has designated a total of 9 counties in three states—New Jersey, Delaware and Pennsylvania—as crop disaster areas due to losses caused by excessive rain, flooding, high winds and hail that occurred on May 22, 2014. New Jersey: Atlantic, Camden, Cape May, Cumberland, Gloucester and Salem counties. Pennsylvania: Delaware and Philadelphia counties. Beginning January 10, 2014 USDA has declared at least 2,001 separate crop disasters across 29 states. Most of those designations are due to the worsening drought. v. The disaster designations posted above were approved by USDA on June 11, 2014. Extreme Rain Events have triggered sever flooding in Brazil’s southern state of Parana since Monday, killing dozens of people and destroying or damaging about 6,500 homes. The floods have affected tens of thousands of people across 80 towns, officials said. The floods have destroyed much of the public infra structure in the region, washing out roads and bridges and prompting authorities to declare states of emergency is multiple towns. One of the worst affected towns is the state capital of Curitiba, one of a dozen cities hosting the 2014 Fifa World Cup Brazil. The latest round of Extreme Rain Events have triggered major flooding across south China affecting about 2 million people, and leaving at least two dozen dead in Guizhou and Sichuan provinces as well as Guangxi Zhuang Autonomous Region. In Guizhou Province alone, flooding has severely affected more than 1.2 million people in 44 counties forcing mass evacuation of at least 88,000 people. At least 18,000 homes were damaged or destroyed, said the Guizhou Civil Affairs Department, reported Xinhua. Power, water and communications lines were cut off across most of Guizhou Province, said reports.